She's a female gamer. She's an attractive Asian woman. She's not exactly the core demographic for a competitive online shooter, but she's got an ace up her sleeve, and possibly a bouquet of fake flowers. 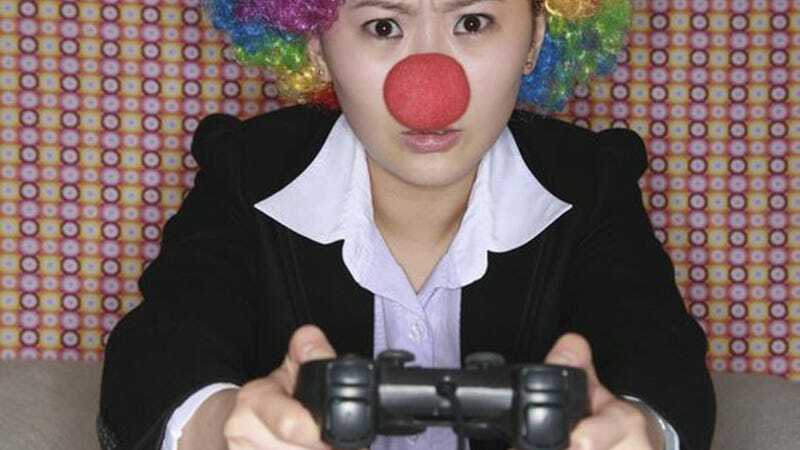 Feel like acting like a clown around her? Fine. Two can play at that game. "Hey baby, have you got a webcam?" are the words she lives for as she's laying waste to her opponents and waltzing away with their flag. In the dude-centric world of online gaming she's a rarity. The few that truly get where she's coming from? The ones too busy appreciating her skills to worry about her gender? They're smiling to themselves as they hear the tell-tale honk of her giant red nose. They know what comes to those that take the flirting too far. The more immature male gamer has an extremely limited range of reactions when presented with a strong, confident female opponent. They lash out. Once they get over that school-boyish teasing, they start the flirting. "You sound cute." "I bet you're hot." "I don't believe you're really a girl. Pics or it didn't happen! Ha ha!" The laughter is added half-heartedly after the fact, covering their intense desire and the impending rejection with a thin veneer of "just kidding." And then she says, "Okay, give me your email address" or "Sure, hop on AIM." Their hearts pound in their chest as they comply. She's female! She has just the hint of an accent! She might be Japanese! He's always wanted to play imports, if you know what he means (he actually means play imported games, he's not that clever). And then he gets this. Clowns. More terrifying than his libido is rabid. His anonymous internet confidence is shattered. He logs off immediately. She captures the flag one last time, sits back, and smiles a supremely satisfied smile. "Oh man, I've always had such a thing for clowns."